A ghostly reminder of destruction, oppression and isolation, Tom Herck’s Confession prompts us to consider the nature of war and existence. At first glance, the installation appears at the viewer as a dreamlike carbonized bunker. The work causes a significant tension between past and present, recollecting Second World War bunkers as well as contemporary quasi-apocalyptic ‘doomsday shelters’. Tom makes his audience experience the political construction of obedience that lies behind confession. However unsatisfactory, the dualistic moralism of war and society cannot (yet) be escaped. The installation’s desolate construction tempts the audience’s curiosity. From within the bunker, -now a confessional-, the visitor can hide from all, save the divine Eye, gazing through the barred window. The audience has become the spineless subject of surveillance. “He who is subjected to a field of visibility, and who knows it, becomes the principle of his own subjection." (Foucault, 1977). 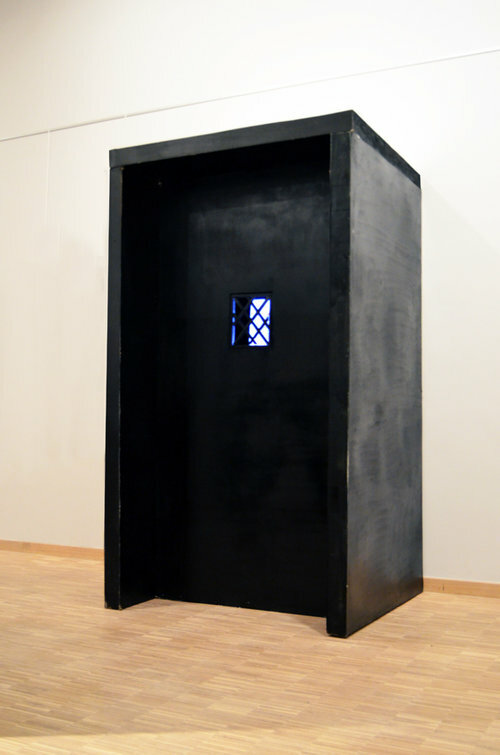 In each of the major world religions the act of confession is an important article of faith. For decades, humankind lived in full belief that all earthly thought and action is circumscribed by the all seeing eye of God. Towards the end of the 17th century, the enlightenment started to emphasize reason and individualism rather than tradition. From this theoretical development sprang sciences, relativity of truth and the notion of privacy. Personal privacy, however, has become increasingly more difficult in the digital age. Sleepwalking into a surveillance society full of CCTV cameras and satellites. Even in virtual space our every ‘move’ has the potential to leave a -digital- trace. Reality TV, confessional blogs. We publish our hopes and fears, and welcome it as much as fear it. Realizing we are being watched, we automatically take care to police ourselves. The collective process of peer review, like a confession, increases the regulation of the self. The all seeing eye of God is being replaced by the omni-present -usually invisible- eye of technology. We no longer confess to God, we confess to one another. Armed by the usual wit and sarcasm, Tom makes his audience analyze the relationship of obedience to disobedience and blind obedience. The supreme military virtue is obedience. The legal and philosophic aspects of obedience say very little about how most people behave in concrete situations. Stanley Milgram’s controversial 1974 experiment was meant to demonstrate a very high proportion of men would fully obey the instructions, albeit reluctantly. Participants were led to believe that they were assisting an unrelated experiment, in which they had to administer electric shocks to a ‘learner.’ These fake electric shocks gradually increased to levels that would have been fatal had they been real. Confession, inherent to our society filled with sophisticated voyeurism, continually produces confessants and confessors, obedience, penitence, just as well as resistance and change.